"It will take two immortals to defeat the ultimate evil. But in the end, there can be only one." 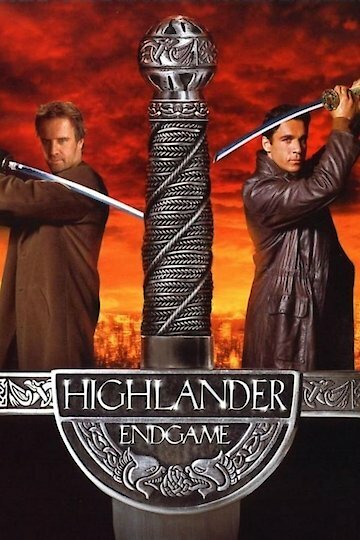 Highlander: Endgame was first shown in the theaters back in 2000. The stars of the film include Adrian Paul and Christopher Lambert. Highlander: Endgame is actually a good entry into the Highlander series according to reviews of the Highlander film sagas. In this installment of the film, Christopher Lambert returns as lead character Connor MacLeod. The new plot begins with the hero Macleod returning to his small Scottish village in the year 1555 to save his mother from the hands of a very cruel village priest. The evil priest destroys several members of his family. This begins a feud that spans the centuries between Connor MacLeod and the priest. Fast forward several hundred years. Connor MacLeod has grown weary over the years of his immortal existence. He has lost too many people and friends that he loved over the centuries. He decides to hide away in a place called the Sanctuary. This is a retreat built on holy ground by the Watchers organization. A group that keeps a close eye on the activities of the immortals like MacLeod. An old enemy returns and attacks the Sanctuary run by the Watchers. The old enemy (priest) and his assassins kill everyone except MacLeod. In this movie Connor MacLeod and Duncan MacLeod team up together to fight the immortal enemy. It is interesting to note that Adrian Paul played the immortal on the television series. Their hope is that both their immortal power is enough to beat Jacob Kell. Connor tells Duncan that he will sacrifice himself. He must take his head and gain his immortal power. This is the only way to defeat their mutual enemy. Highlander: Endgame is currently available to watch and stream, buy on demand at Amazon, Vudu, Google Play, iTunes, YouTube VOD online.